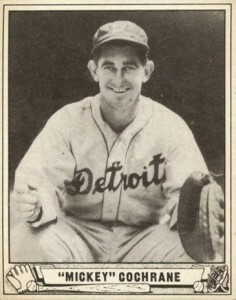 Mickey Cochrane set the standard for team-leading catchers who captained their team with great defense and a solid bat. Although his career was cut short by injury, he led his teams to five pennants and three World Series titles in his 13-year career. In this top list, Cochrane's best baseball cards are outlined with appearances from his playing days and those from more modern sets. Shop for Professionally Graded Mickey Cochrane Cards on eBay. Although he was commonly known as "Mickey" by baseball fans around the world, he was born Gordon Cochrane and those closest to him never used his famous nickname. Cochrane began his career with the Philadelphia A's, helping the team make three consecutive World Series appearances and two titles. During that three-year stretch from 1929-1931, he batted .331, .357, and .349 and won the 1928 MVP Award. 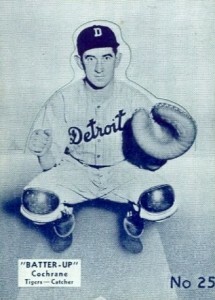 As the A's team was being broken up, Cochrane was traded to the Detroit Tigers where he reached even greater heights of popularity. His defense and leadership landed him a second MVP award in 1934 even though his main competitor for the award, Lou Gehrig, won the Triple Crown that year. 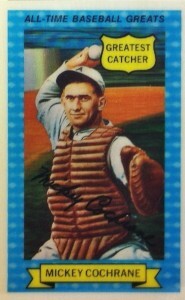 Cochrane passed away in 1962 and so there are very few autograph samples for collectors to fight over. Upper Deck has, of course, made a few cut autograph cards, including their 2005 Upper Deck Hall of Fame set, but their quantity is severely limited. Even though Cochrane has been included in the recent Panini sets like 2012 and 2013 Panini Cooperstown, there are still few jersey and bat relics available. In the 2003 SP Legendary Cuts set, Upper Deck included an insert set called Historical Impressions which were rubber stamps facsimile of the player's signature and could serve as an alternative for collectors looking for a Cochrane autograph. As you'll see in the list, several of Cochrane's key cards are found in the most popular sets in the 1930s, giving them limited availability to many collectors. One way to get around this problem is to track down a reprint of these cards. One particular reprint I would recommend is of the 1933 Tattoo Orbit set that was part of an extremely limited gum series issued by Wrigley's. Collectors looking for inexpensive Cochrane cards can also find options in both the 1960 and 1961 Fleer Baseball Greats sets. One of Topps' first products was the 1951 Connie Mack's All-Stars set that featured 11 cards which could be modified into die-cut stand-ups. While Cochrane appears in the set, it is very rare to find undamaged examples. Cochrane also appeared in the 1976 Topps set, as he was honored by The Sporting News as the all-time All-Star catcher in baseball history. Given Cochrane's popularity and status as one of the greatest catchers in baseball history, his early baseball cards are both quite rare and valuable. In building this top list, both value and historical importance where balanced with collectability and availability. Along with their regular set of current players, Kellogg's also issued a set of legendary players in their 3-D card format in 1972. Each of the 15 players included in the set where designated as the greatest in a particular category with Cochrane being designated the "greatest catcher." Incidentally, Babe Ruth, was listed as the "greatest ever." The 1961 Golden Press set consists of 33 cards that came all together in a perforated booklet. As with many other sets, the first few cards of the set (and in the case of the Golden Press set, the last few cards as well) have a value premium as they were frequently damaged and worn. 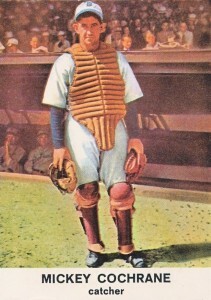 The set's painted photographs are some of the most beautiful cards for many of the legendary players included in the set and Cochrane is among the options. 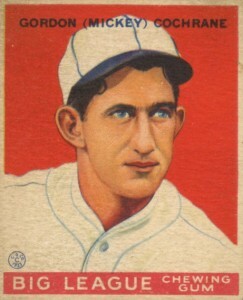 As the Diamond Stars set was issued over the course of three years, Cochrane's card can be found in three different versions with statistics for 1934, 1935, and 1936. The 1934 and 1935 versions have green backs while the 1936 version has a blue back. Mickey's 1934 Goudey card has both his first name and nickname on the front. 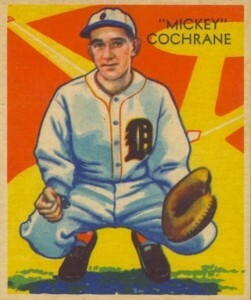 The nickname "Mickey" came from the assumption that Cochrane was Irish when he was a rookie prospect with the A's. He was actually Scottish and was also often called "Black Mike" by friends because of his sometimes-dark personality. Mickey's 1934-1936 Batter-Up card can be found in the most common black-and-white version along with several color tint variations, including green, blue, and red. National Chicle issued this set over three years and cards higher up on the 192-card checklist are much more difficult to find. A new addition to 1940 Play Ball from the previous year's set was the inclusion of retired players like Cochrane. His playing career came to a sudden end in 1937 when he was inadvertently struck in the head New York Yankees pitcher Bump Handley. 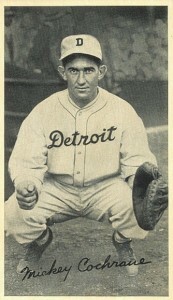 Cochrane was eventually able to return as the manager of the Tigers but he was never able to catch another game. 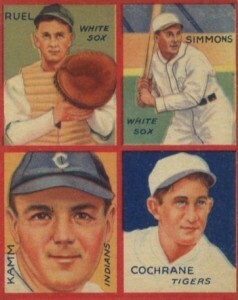 The 1935 Goudey 4-In-1 set combined four players (often teammates) onto one card. Cochrane is combined with Al Simmons, his Hall of Fame teammate with the A's, and two other lesser-known players from the time. Willie Kamm was a third baseman for the Chicago White Sox and Cleveland Indians. Muddy Ruel, as his photo suggests, was a catcher for several teams, including the White Sox and Washington Senators. 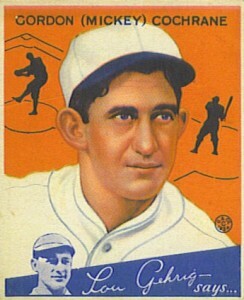 The reverse side of the 1935 Goudey cards serve as smaller pieces to larger photographs of several players, including Cochrane. Gold Medal Flour was the parent company that issued Wheaties Cereal and, in honor of the 1934 World Series, they released a photocard series that is beautiful in its simplicity. Six players were each featured from the Tigers and St. Louis Cardinals squads. The key card in from the set is terms of value is a rare appearance by Dizzy Dean. 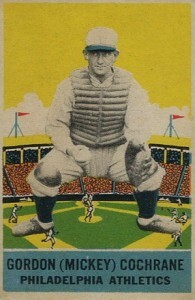 The 1933 DeLong set was one of the first to include trading cards with gum and the unique design choice to have the players appear as giants on the card have made this small 24-card set incredibly popular. The reverse side of Cochrane's card gives tips on how to be a better catcher. This was something Cochrane certainly didn't need as he led the league in putouts six times in his career. The Mickey Cochrane rookie card in the 1933 Goudey set remains his most popular card on auction sites today with near-mint graded copies approaching $400. Cochrane's legacy as one of the greatest catchers ever can be seen in the continued popularity of his key baseball card appearances. 1936 R311 Glossy Premium Mickey Cochrane HOF SGC 2 ! !